Achieving a whiter smile is something that I am forever on the look out for. That is to say, I am forever looking for an alternative to paying sky high prices at the dentist. We all know that the dentist is the way to go if you really want to achieve a nice bright white smile, but in reality, not everybody can afford to pay hundreds of pounds for the treatment. Therefore, whenever I see a new product which claims to make your teeth whiter, I can’t help but want to put it to the test. 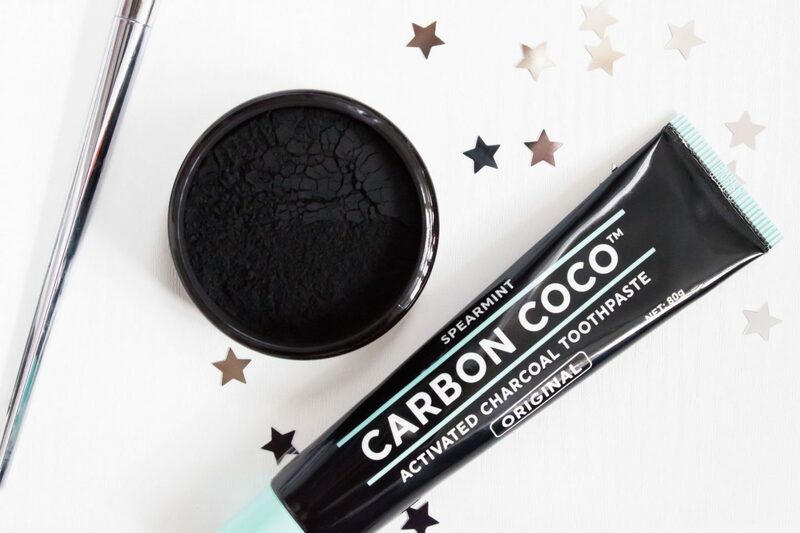 Carbon Coco is one such brand which offers natural whitening products for your teeth, they’re also well known for oil pulling, although I haven’t quite been able to pluck up the courage to try that one. Carbon Coco offer certified organic coconut shell charcoal which naturally brightens your smile. It is also said to improve the overall health of your mouth by removing toxins, stains and plaque from your teeth. This all sounds great, but does it actually work? 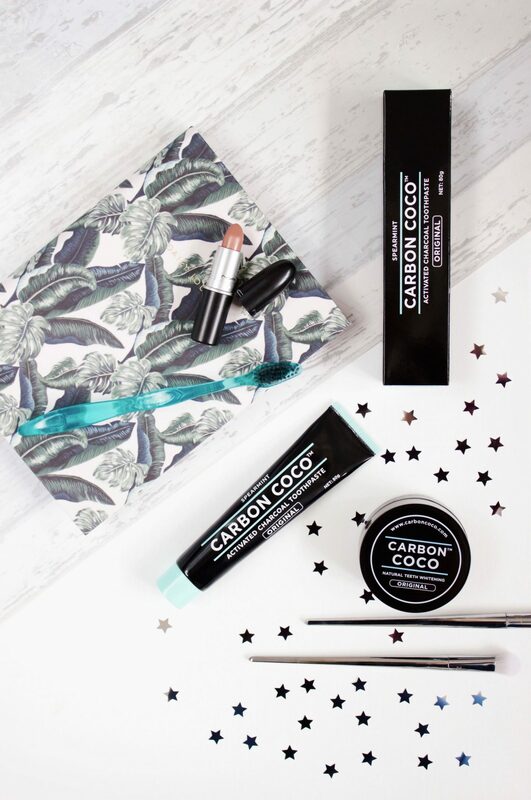 The Ultimate Carbon Kit* from Carbon Coco contains the Activated Charcoal Toothpaste, Activated Charcoal Tooth Polish and one toothbrush made with bamboo bristles. To use, you simply dip a wet toothbrush into the activated charcoal powder and brush your teeth as normal. Be warned, this is messy and can lead to a rather black mess in the bathroom sink. The powder is really fine so it can easily go everywhere, I’d recommend being really careful with the pot and making sure that the lid is always on tightly because you do not want to be knocking it over. The powder does not taste particularly of anything; however it is certainly not horrible and I had no trouble brushing my teeth for a couple of minutes before rinsing it out. Once you have used the powder you then go in again with the toothpaste, this is of course sticking with the theme of black in colour, however it has a nice spearmint flavour which is pleasant enough. The issues I found were that even after using the toothpaste I would be left with a few bits of powder which had somewhat seeped into the area between my gums and teeth; it was fairly easy to resolve but it was a bit irritating nevertheless. The mess was also a downside. I can handle a bit of a mess but this really does go everywhere unless you are really, really careful and let’s face it, brushing your teeth is never the neatest of activities. I unfortunately found that I had to brush my teeth again before I was completely satisfied. 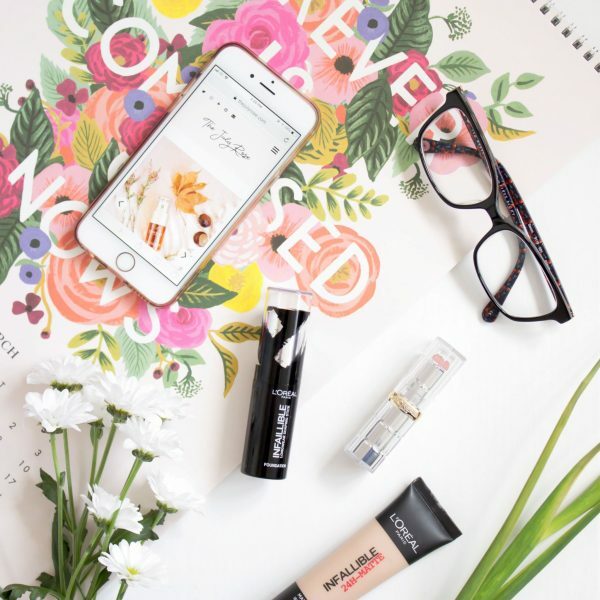 In respect of seeing a whiter result, I think to an extent that this did work, however it was very gradual and I found that it required long term use on a regular basis in order to see the results. I didn’t really notice much difference in truth, therefore I have to in some extent way up the pros with the cons. Of course, it is a much cheaper alternative to paying for treatments at the dentist, however I would be more inclined to save up the funds and pay for something which I know will give me results that I am looking for. That being said, after use I did think that this left my mouth feeling squeaky clean, although I am unable to comment on bacteria, PH and indeed the overall health of my mouth because this is something which I am not physically able to measure the impact of. I am no scientist. I love the packaging of the products and the ethos behind it, however I feel that for me that this did fall short of expectations. Have you tried Carbon Coco?